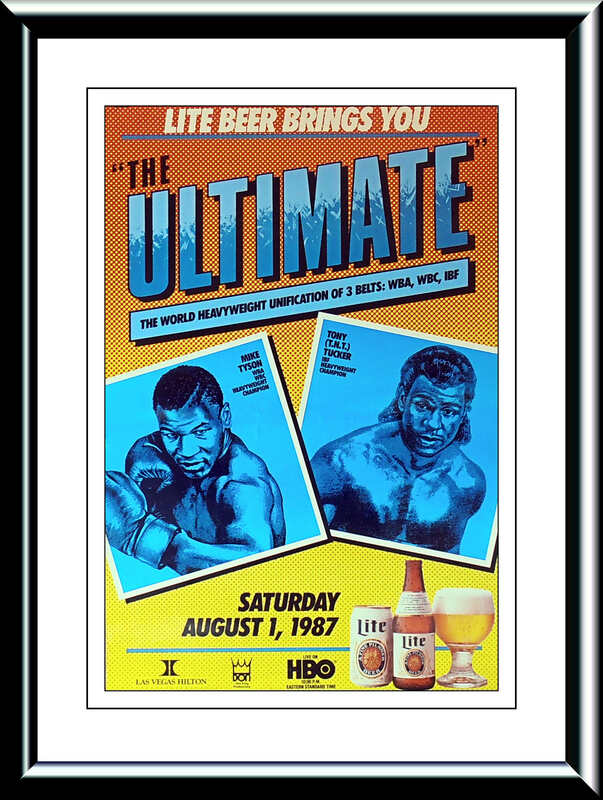 Description : Here we have the super scarce original Millar Lite vintage fight sponsors poster from the Las Vegas Hilton for the Heavyweight Unification clash between WBC/WBA Champion Iron Mike Tyson & IBF Ttile holder Tony TNT Tucker. 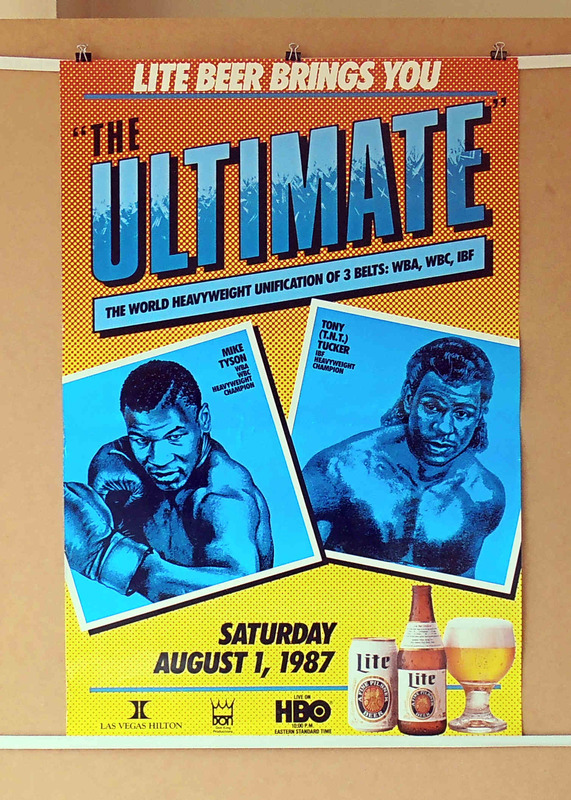 Billed as The Ultimate on August 1, 1987 for the WBA, WBC and IBF Heavyweight championships, HBO had organized a unification tournament in an effort to find the next Undisputed Champion. Mike Tyson was able to defeat Trevor Berbick and James Smith to capture the WBC and WBA Heavyweight titles during the series. Meanwhile, Tucker was scheduled to challenge Michael Spinks for the IBF title with the winner to meet Tyson for right to become the Undisputed Champion. Spinks, however, withdrew from his planned fight with Tucker, instead chosing to face Gerry Cooney. The IBF subsequently stripped Spinks of their title. The IBF, WBA and WBC organized a double main event on May 30, 1987 that would determine who would meet for the Undisputed Championship. Tucker would meet James "Buster" Douglas to determine the IBF champion, a match Tucker would win by 10the round technical knockout. 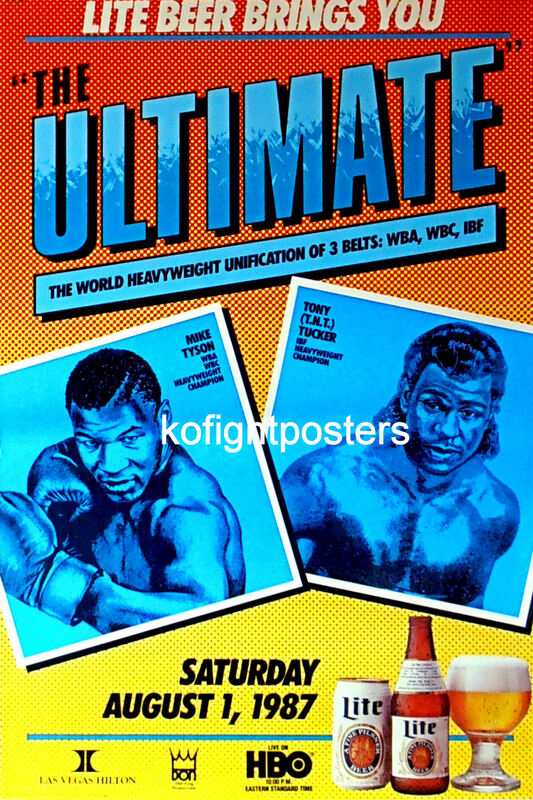 Afterwards, Tyson and Pinklon Thomas would meet for the WBA and WBC championships with Tyson earning the victory by 6th round technical knockout, setting up the Tyson–Tucker match. The two men would have a relatively short amount of time between their fights, only 64 days. Tyson had been met with little resistance from Berbick, Smith and Thomas, however, Tucker would arguably become one of the toughest opponents Tyson would face during the early portion of his career. Tucker came out strong in round 1, hitting Tyson on the side of the head with a short left hook. Tucker would continue to fight Tyson aggressively in the early rounds and actually won rounds 1 and 3 on the scorecards. However, as the fight went on, Tyson began to find his rhythm and dominated Tucker during the middle rounds, landing several power punches on Tucker during rounds 4 through 7, leading to Tucker throwing less punches and either grappling Tyson or avoiding him entirely in an effort to reduce Tyson's effectiveness with his punches. During the final two rounds, Tucker began taunting Tyson by winding up his right glove, shuffling his feet and finally dropping his hands and beckoning Tyson to hit him on the chin. In the end, though, Tyson was named the winner via unanimous decision, winning all three judges scorecards by the scores of 119-111, 118-113 and 116-112. With his victory Tyson would become the first Undisputed Heavyweight Champion since Leon Spinks in 1978.